It started as a joke. But Pittsburgh's Jeff Goldblum Day is getting a lot of interest. 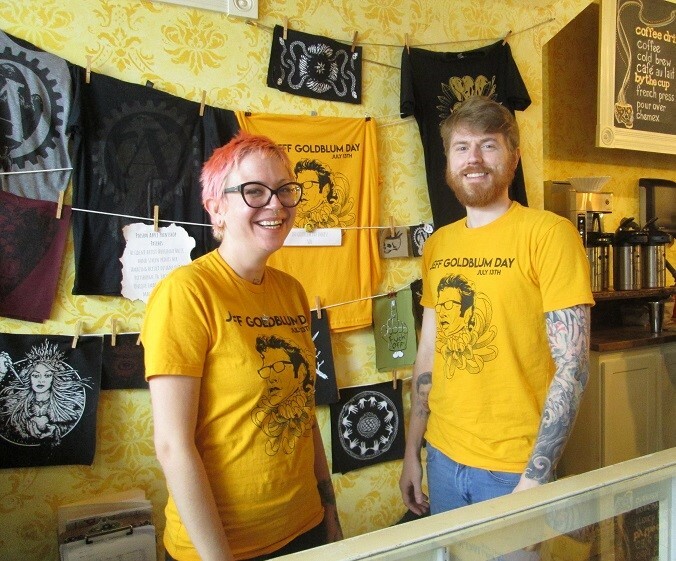 Shauna Burd and Matt McKelvey of Artisan Tattoo in Garfield are gearing up for Jeff Goldblum Day by selling T-Shirts and buttons. Photo by Kristy Locklin. It started as a joke. But Pittsburgh’s Jeff Goldblum Day is getting a lot of interest. Matt McKelvey, a tattoo artist at Artisan Tattoo in Garfield, thought it would be funny to host a Jeff Goldblum Day at the shop, with ink specials, merchandise, trivia and other activities honoring the actor. Goldblum, like beloved local boy Michael Keaton, happens to be a Pittsburgher. Manager Shauna Burd agreed and created a Facebook event for the occasion. There now are more than 1,500 people interested in the July 13th celebration. Dressing up like Jeff Goldblum is encouraged. 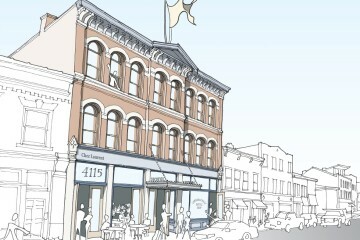 And there’s more: At 10 p.m. that night, Row House Cinema in Lawrenceville will show a “top-secret” Jeff Goldblum film. Tickets are $10 and the Artisan staff will be on-hand to sell more Jeff Goldblum wares (if there are any left). Row House Marketing Manager Kelsey Zehmisch won’t reveal any details about the flick but is confident fans will be entranced. Artisan’s event actually won’t be the first Jeff Goldblum Day celebrated here in town. In 2004, Pittsburgh City Council officially proclaimed July 13 to be “Jeff Goldblum Day,” citing his West Homestead roots and contributions to the silver screen. The actor was nominated for an Academy Award in 1996 and recently received a star on the Hollywood Walk of Fame. Since Mayor Bill Peduto took office in 2014, there have been more than 2,600 designated “days” issued recognizing organizations, families, centenarians and celebrities such as Billy Joel and Jake Gyllenhaal (who is a descendant of 25th Pittsburgh Mayor, James Lowry, Jr., according to Gloria Forouzan, Peduto’s office manager and coordinator of proclamations). 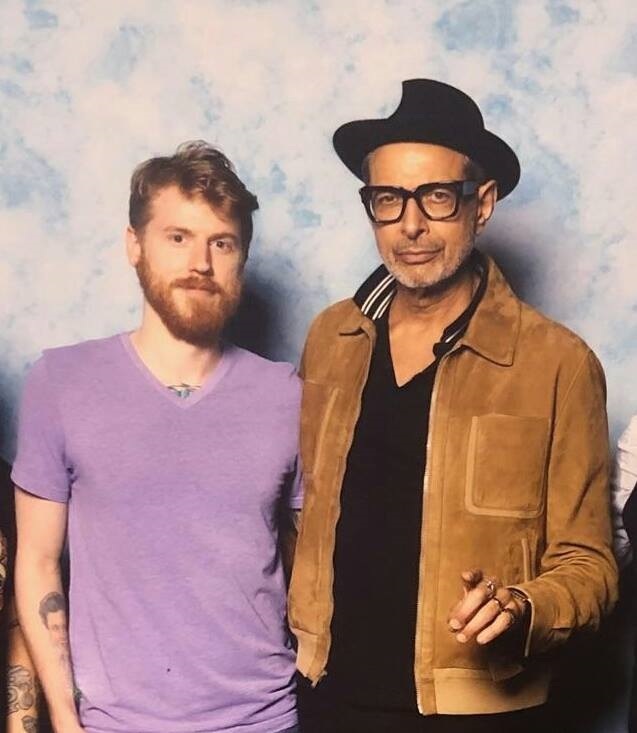 Tattoo artist Matt McKelvey met Jeff Goldblum at a convention earlier this year. Photo courtesy of Matt McKelvey. Former City Councilman Doug Shields sponsored 2004’s Jeff Goldblum Day. With Goldblum back in the spotlight in a big way after returning in 2016’s “Independence Day” reboot, drawing raves for his performance in last year’s “Thor: Ragnarok” and appearing (all too briefly) in “Jurassic World: Fallen Kingdom,” Burd and McKelvey think Jeff Goldblum Day should be an annual Pittsburgh affair. It seems they’re not alone: Scotland native Stuart Hunter, a recent customer at Artisan’s cafe who is in town for a business meeting, said he wants to return to Pittsburgh for Jeff Goldblum Day, citing “The Tall Guy” — a 1989 Jeff Goldblum gem about an Elephant Man musical — as his favorite. “It’s has a very dark, sarcastic sense of humor,” says Hunter, adding that Jeff Goldblum graces the latest cover of British GQ. Burd plans to get a small Jeff Goldblum tattoo on her leg and says people with the same desire should show up early to the shop on July 13. Depending on their size and placement on the body, the tattoos will range in price from $20 to $150.